During industrial processing, polymer melts are exposed to local high cooling rates, strong deformation rates and high pressures. 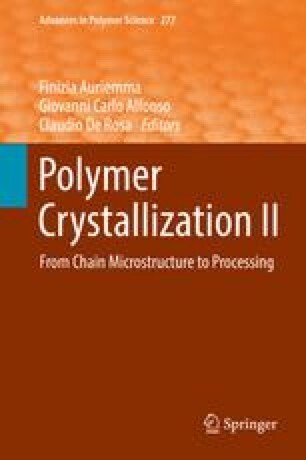 Nowadays, research in the field of semi-crystalline polymers still strives towards an accurate prediction of the evolution and final appearance of the crystalline morphology in polymer products. After all, the amount, number, phase and orientation of the crystallites act in a combined way and control the final optical and mechanical properties. This chapter discusses recent experimental and model developments concerning the influence of industrially relevant cooling rates and pressures on the non-isothermal crystallization of both an isotactic polypropylene and a linear low-density polyethylene grade. The influence of flow gradients is discussed in Chapter (Roozemond et al., Adv Polym Sci, 2016).